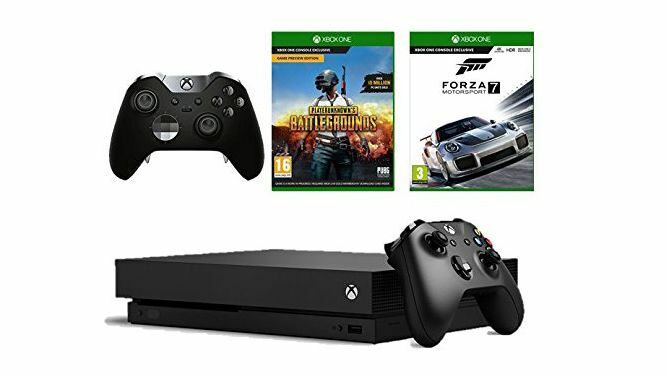 Xbox One X with Elite Controller, PUBG, and Forza Motorsport 7 now only £499.99 thanks to stellar Prime Day deal! This Amazon Prime Day deal is already 12% claimed as it is a limited stock Lightning Deal, so we advise you to view the deal below immediately and then, if you like the idea of an Xbox One X, Elite Controller, PUBG, and Forza Motorsport 7 for only £499.99 instead of £609.28, go ring it up ASAP. Now, considering that Microsoft's rival 4K console, the Xbox One X, is going for north of £429 right now on its own (at GAME, for example, it is currently £449 on its own), you can start to see how amazing this bundle deal is. "There can be no doubting the Xbox One X's power, with Microsoft's new console capable of pushing out over a whopping 8 million HDR-equipped pixels. Games look and sound better than they ever have before and, when the hardware is fed a title built purposefully to tap into its raw power the audio-visual experience is spectacular." Obviously, as this is an Amazon Prime Day Lightning Deal, you'll need to move sharpish if you want to land the bundle at price point.